This glass screen protector is designed for a perfect fit over your phone screen. Sensitive yet durable, it is the perfect protection against life's inevitable cracks and scratches. Specifically designed for your iPhone's screen, the glass features rounded edges to blend perfectly. Its such a perfect fit, you will hardly notice it's there! 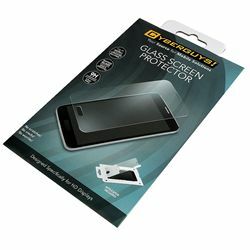 The glass screen protector kit includes: a screen cleaning cloth, dust absorption sticker, alcohol prep pad and an applicator for a easy, quick installation. Glass is made with rounded edges so it can be used with or without a case. Made of flexible 9H rated tempered glass 0.3mm thick Made of flexible 9H rated tempered glass 0.3mm thick Made of flexible 9H rated tempered glass 0.3mm thick.